We packed it in. 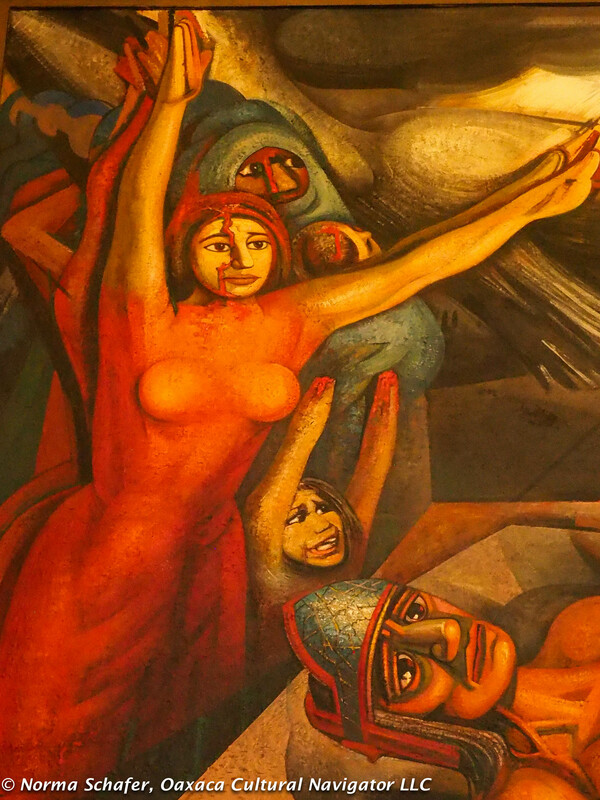 After a Sunday morning at Casa Azul followed by seeing the largest private collection of Diego Rivera and Frida Kahlo paintings at the Museo Dolores Olmedo, we took an UBER (safe, easy, the only way to get around in Mexico City, despite USA negatives) to the Embarcadero de Nativitas in Xochimilco for a boat ride on the last Aztec canals in Mexico City. Colorful fun. 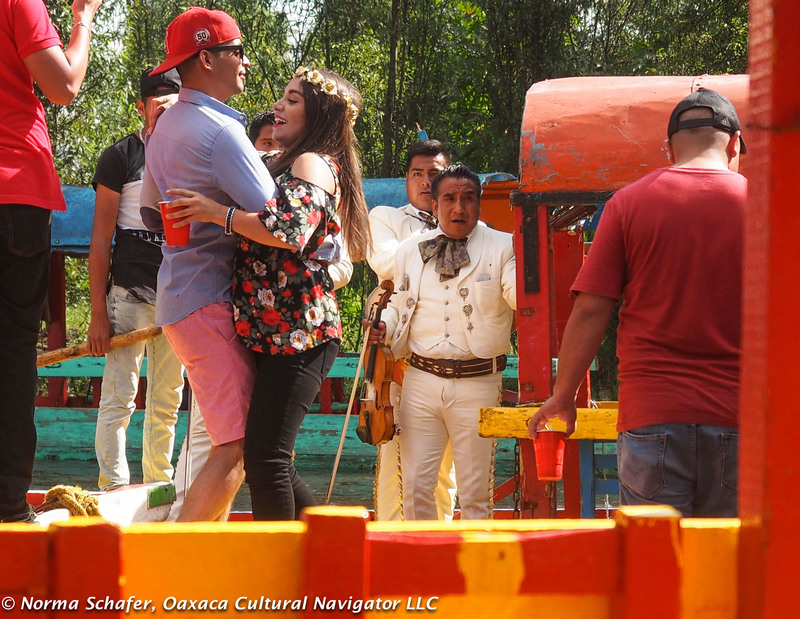 Fake flower crown vendors, Xochimilco. 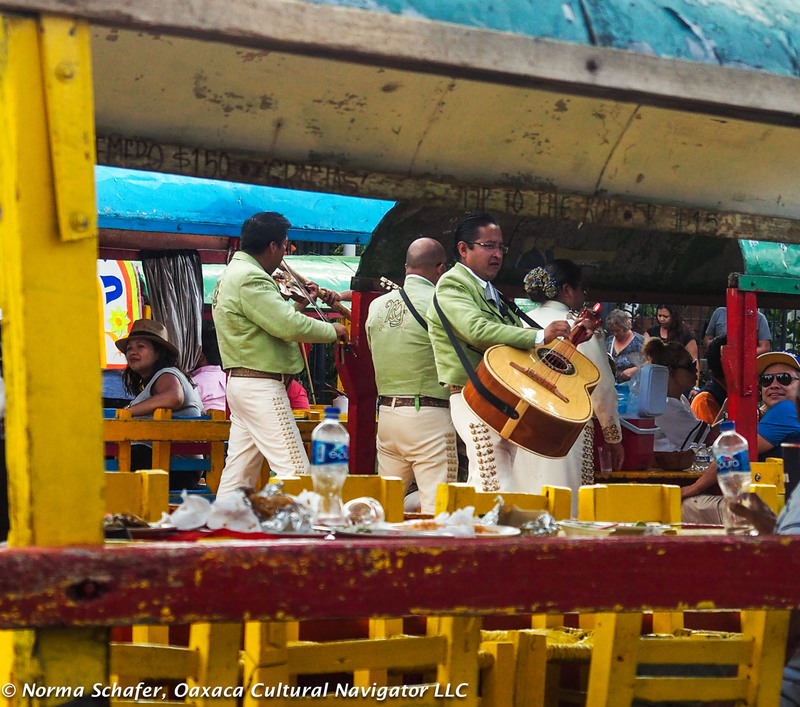 How about some lively mariachi music? 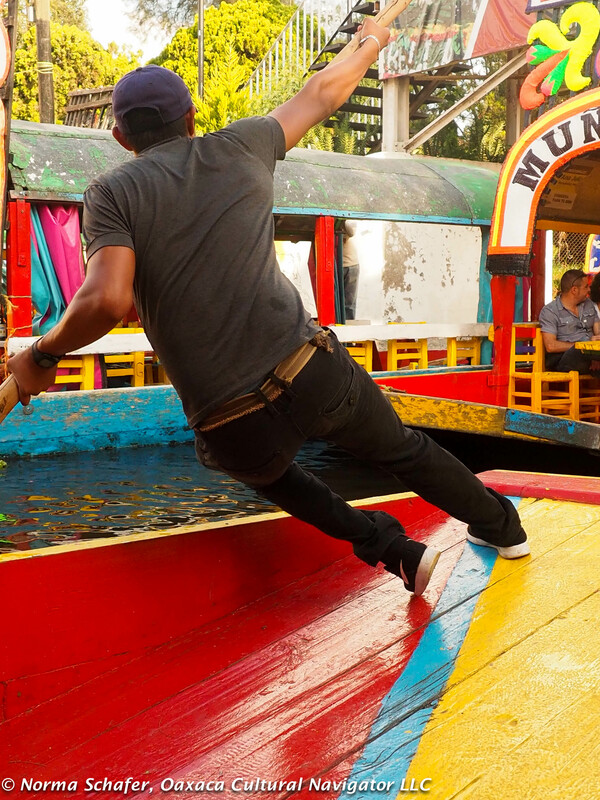 A Mexican tradition. plus an entourage of mariachis playing guitars, trumpets, accordions and violins. 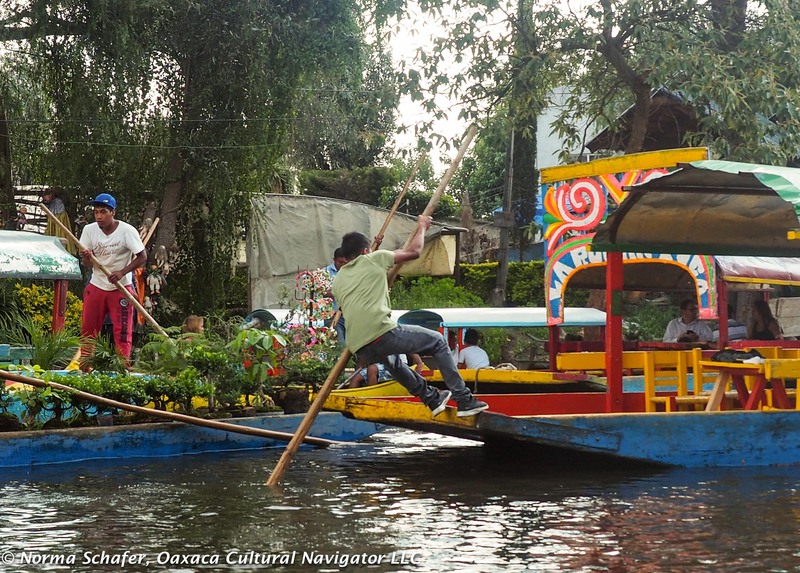 Sunday is the best day to be on the Xochimilco lagoons for people-watching. It’s almost like riding a gondola in Venice, Italy. Maybe better. Much more colorful. Sometimes families bring their own cook and the smell and smoke of grilling meats pervades the waterways. 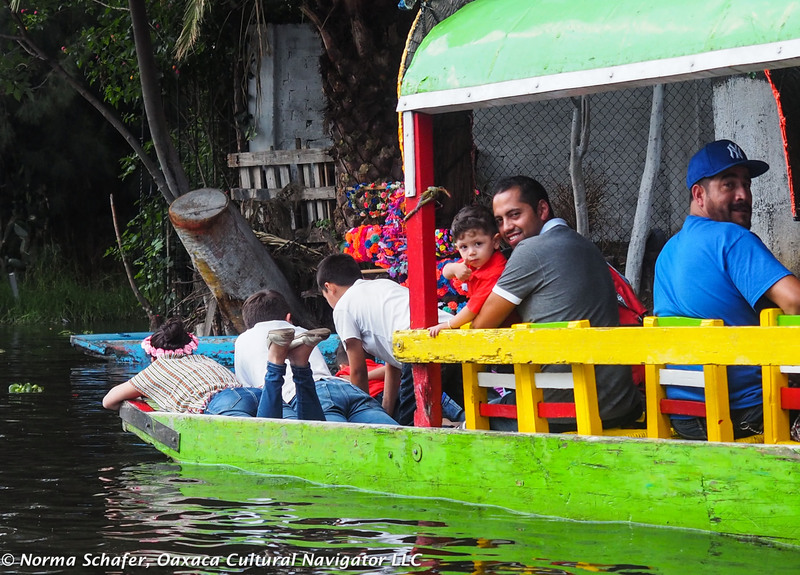 Sometimes families bring their own beer and the bottles pile up for the longer rides through the canals. You can buy a pig en route, just transfer from their boat to yours. 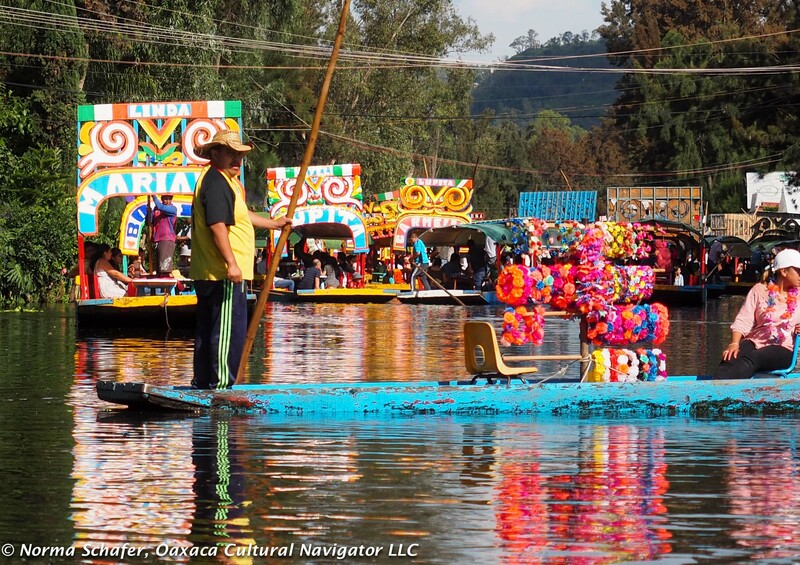 It is festive, relaxing and the quintessential Mexican experience. Is it touristy? Yes. But, it’s also real because locals do this as part of birthdays, anniversaries, and any other excuse to have a celebration. 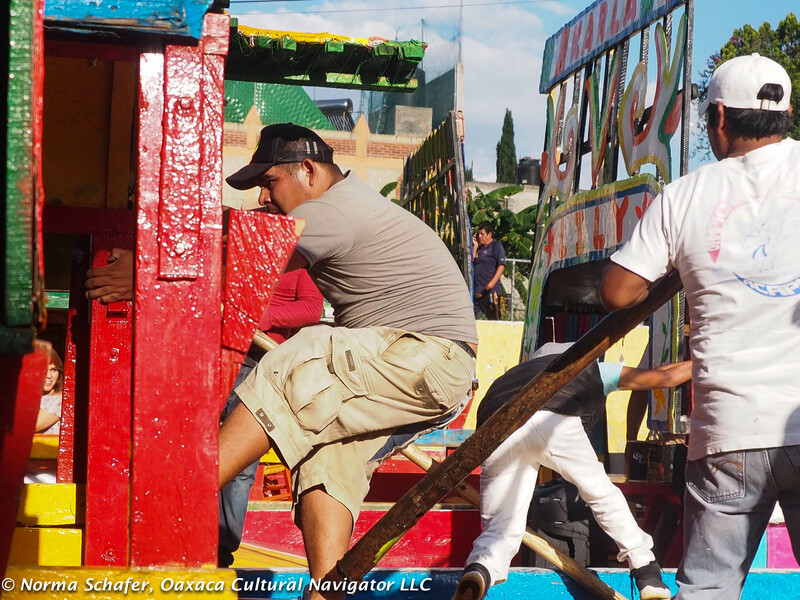 Sometimes, you see two trajineras tethered together, so groups of forty or more can jump between boats, dance, sing and generally carouse. Children find their entertainment, too, relaxing in the sun, playing games, and dancing along with the adults. Just being together. 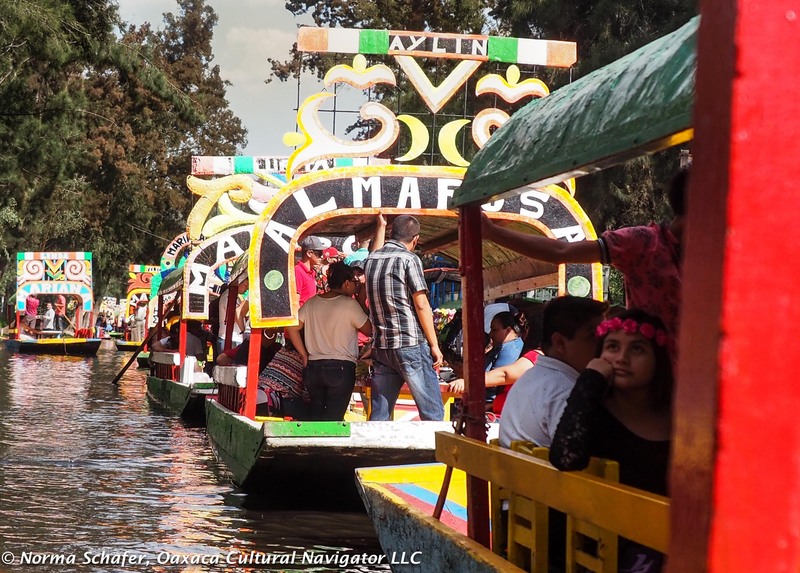 The rate is fixed per boat: 350 pesos per hour. We went out for two hours and the next time, I think being out on a four-hour excursion would be better. Doll island. Some say its haunted. Then, we could get into the more remote areas where birds and flowers are more prevalent than people. 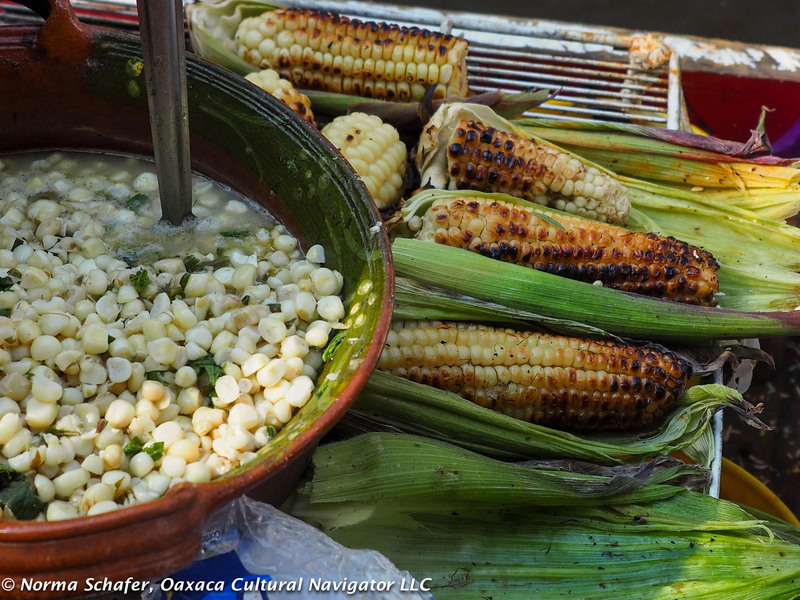 I had fresh roasted native corn on the cob. Valeria chose esquites. Hungry? 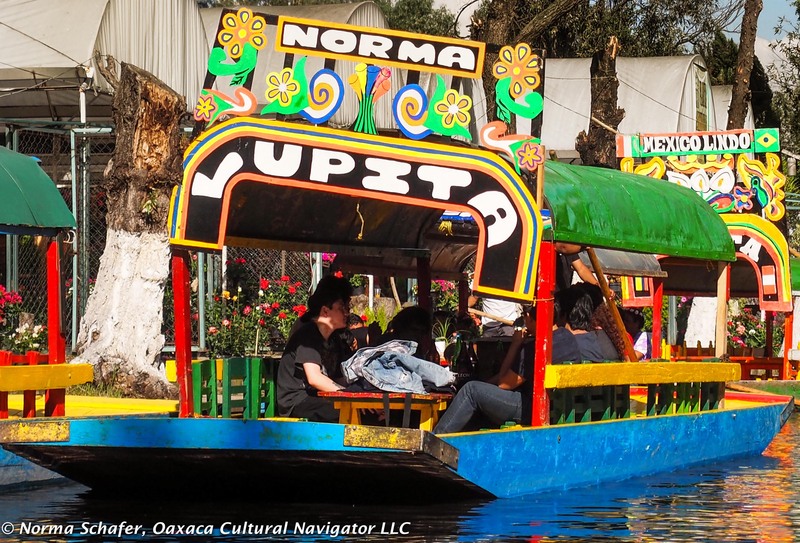 A small boat will pull up and entrepreneurial vendors will sell you grilled corn on the cob slathered with mayonnaise, chili and lime juice. Thirsty? Beer and soft drinks are delivered the same way. 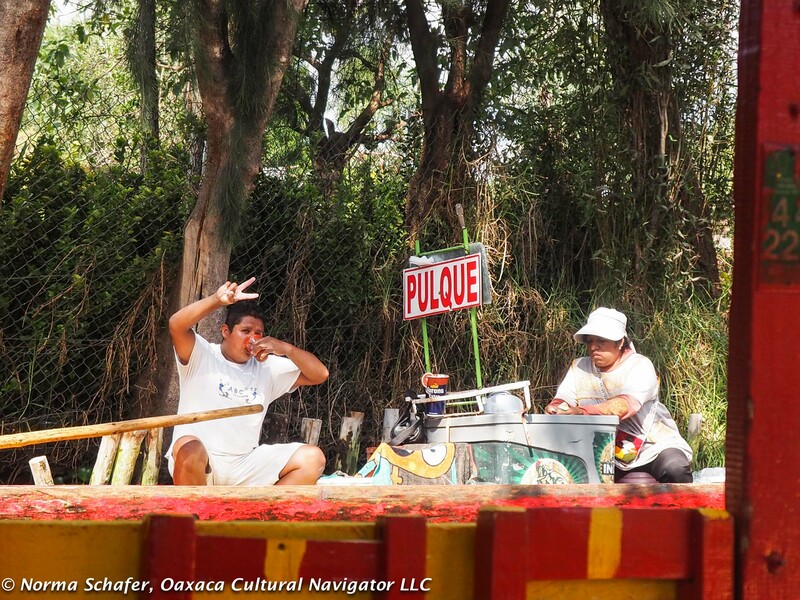 How about a pulque? 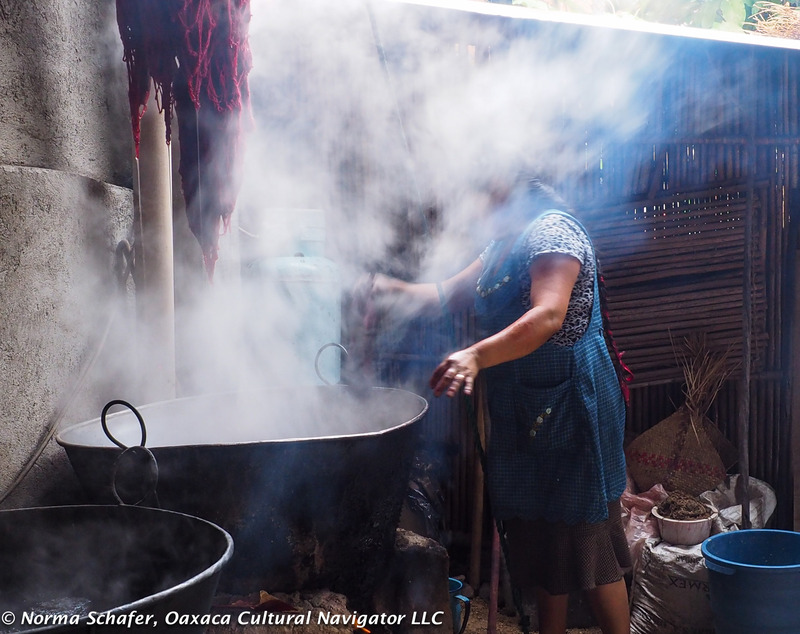 Fermented agave sap for Aztec power. Want a souvenir? Buy a fake flower crown in any color of the rainbow. Need a pit stop? Clean facilities offer service for five pesos. Buy a synthetic shawl or a plastic doll. Cheap fun. On the return trip to the docking area, we had a traffic jam. Boats jammed up against each other, unable to move. Moving the boat along. 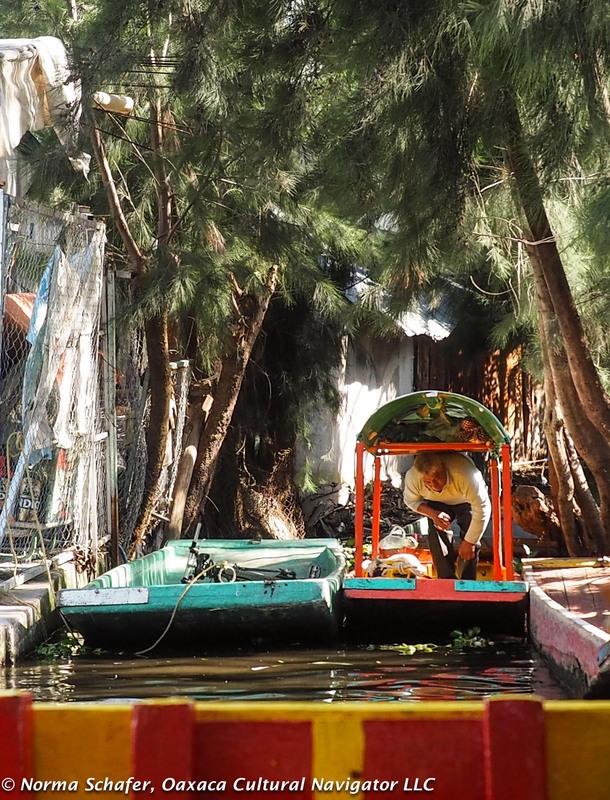 You can even buy plants from passing gondolas. The gondoliers doing a ballet of pushing the long stick into the muck and against the next boat to jockey into a clear passageway. Straining to move the boats on the last leg of our voyage. Sometimes, they jumped boats to help each other out. Muscles straining, taut. Bodies at forty-five degree angles to the water. The push-pull of getting out of the traffic jam. I never heard a curse, only the sound of laughter and music from the party-goers, only too happy to spend extra time on the water as the boatmen sorted it out. A jumble of color at the docking station. 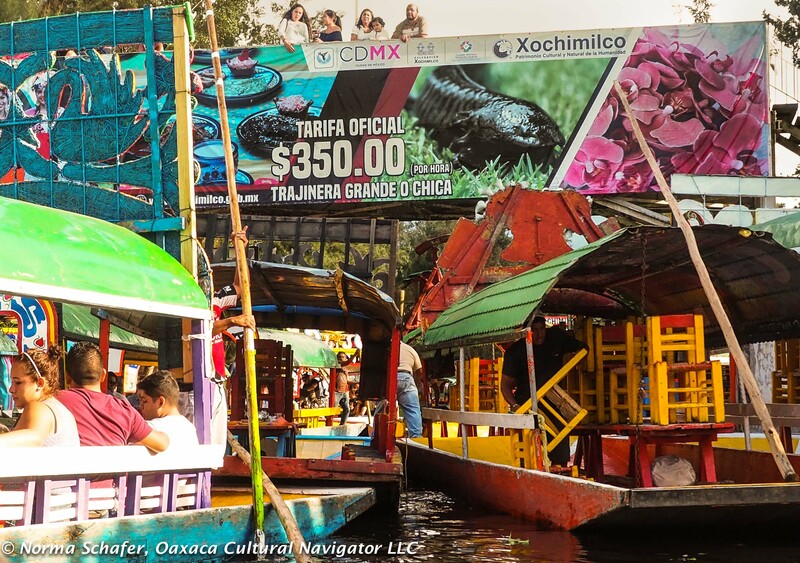 Xochimilco is the last remaining vestige of what the lake region looked like during the Aztec period, pre-Conquest 1521. Local emptying, then anchoring his launch. This is how people got around from one island to the next. The people who live here still do. They are gardeners, growers of fruits and vegetables. It used to be that not too long ago the boats were covered in fresh flowers. Today, they are adorned with painted wood. 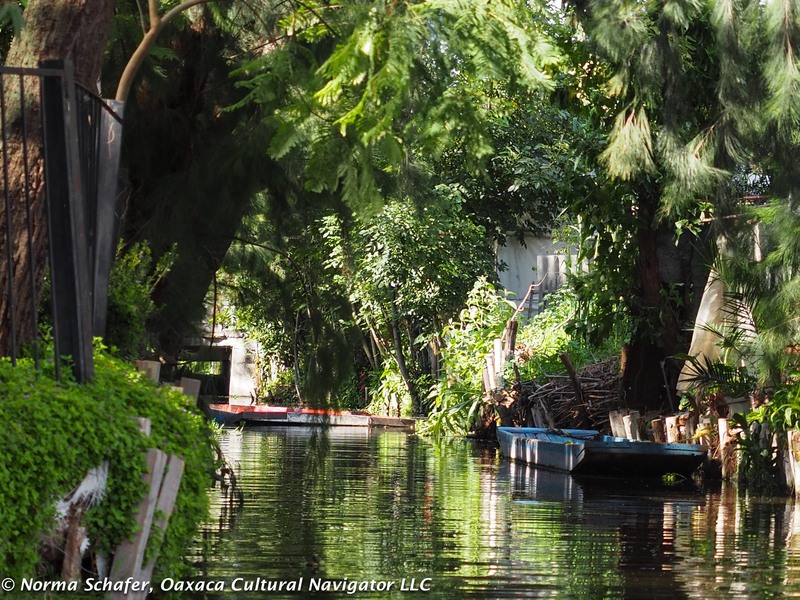 A remote waterway off-the-beaten path, like a jungle. 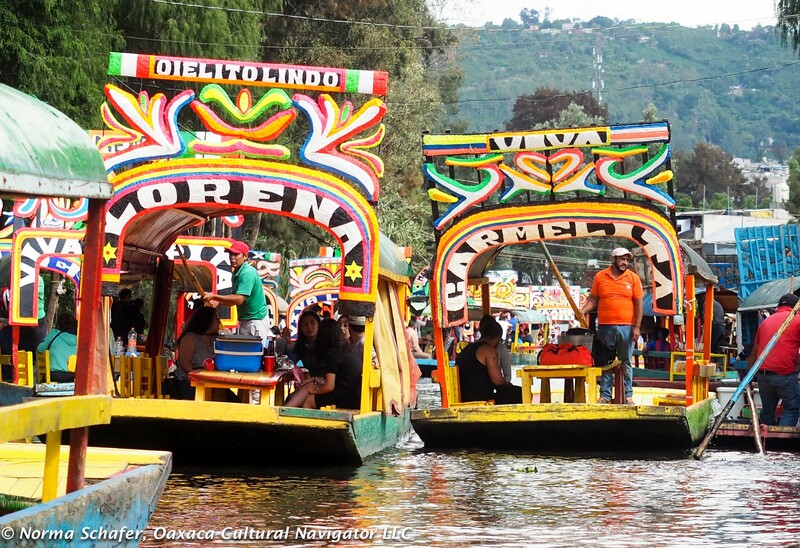 The next time you are in Mexico City, allow yourself at least a half-day to enjoy this respite from city life. 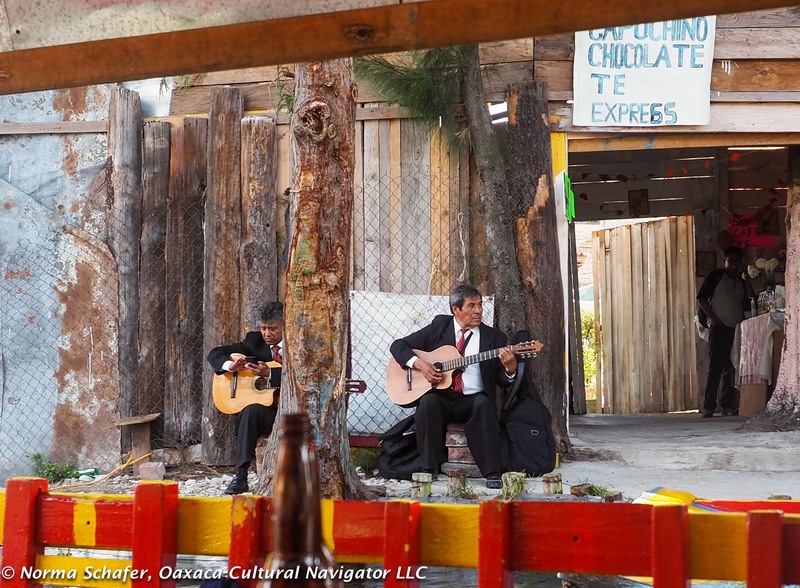 Perhaps I’ll spend my next birthday here, hire a mariachi band and dance the afternoon away. For now, I’m at my other home in North Carolina, enjoying August heat and humidity, and the comfort of friends. Norma Lupita, followed by Mexico Lindo. Porsupuesto. 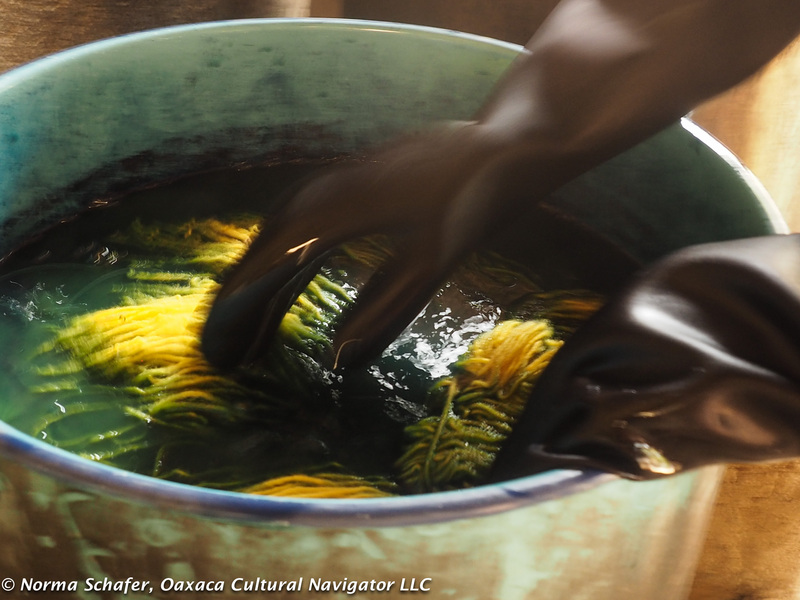 Oaxaca Valley and Coast Textile Study Tour is set to start Sunday, January 14, 2018, in Oaxaca city and end Wednesday, January 24, 2018, in Puerto Escondido, on Oaxaca’s Pacific coast. 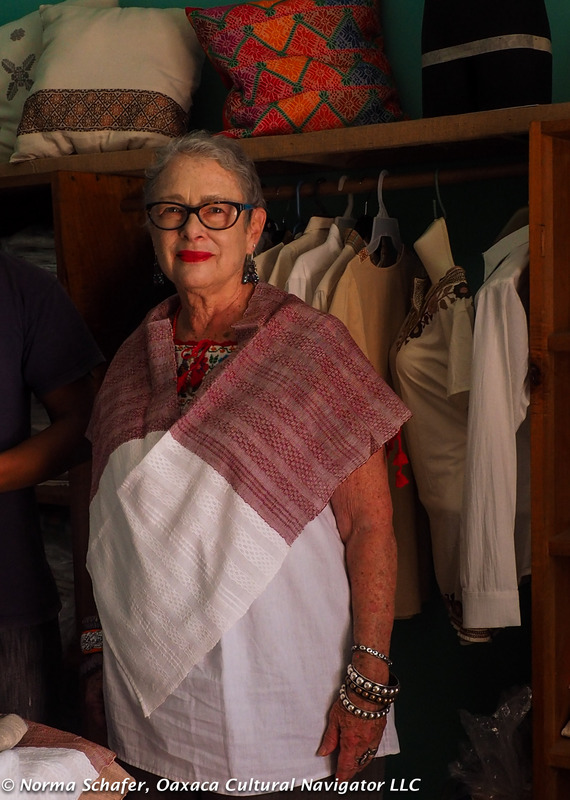 In between, you will meet artisans in their homes and workshops, enjoy great cuisine, dip your hands in an indigo dye-bath, travel to remote villages you may not go to on your own. 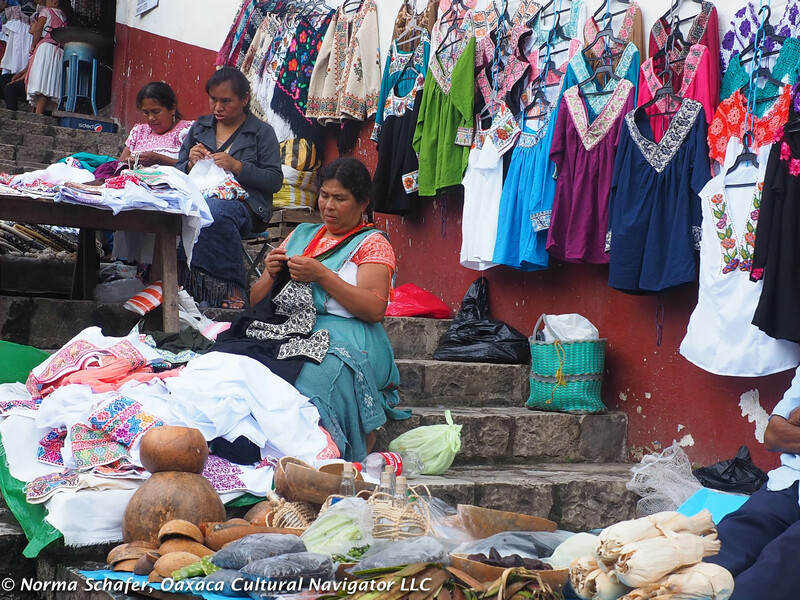 This is an eclectic study tour with a focus on textiles and Oaxaca’s vast weaving culture. It also includes visits to graphic arts studios in the city. Sold Out! Contact me to add your name to the waiting list. 1) Sunday, Jan 14. 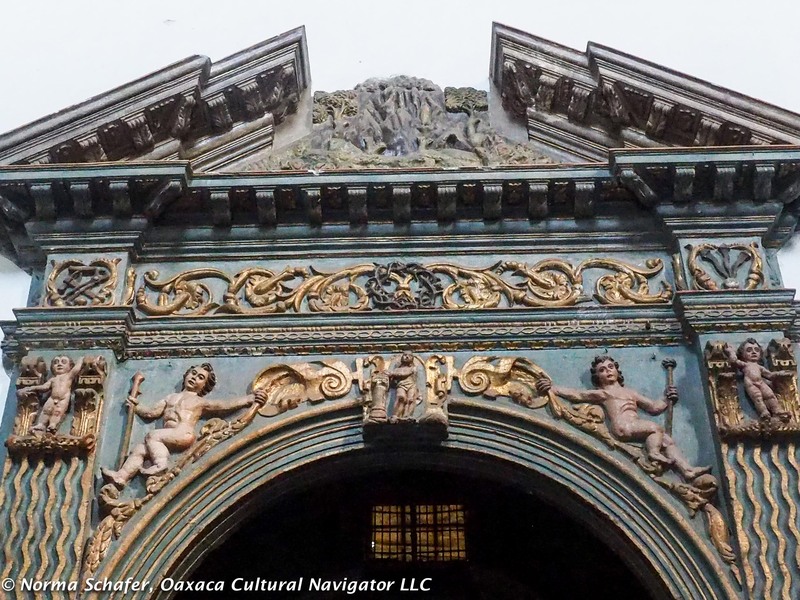 – Arrive in Oaxaca City and check into our comfortable bed and breakfast inn. 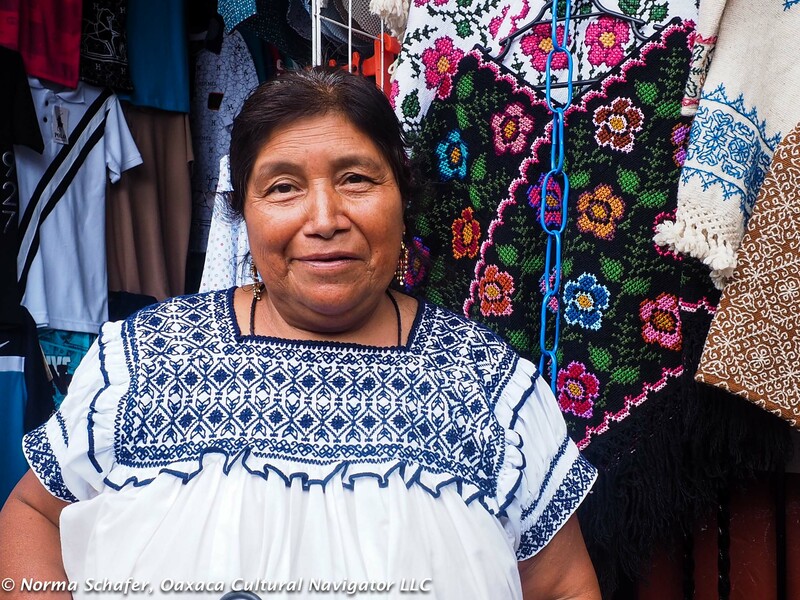 On Oaxaca’s coast, we will be joined by a Cultural Anthropologist who has been working with local weaving villages for the past six years. 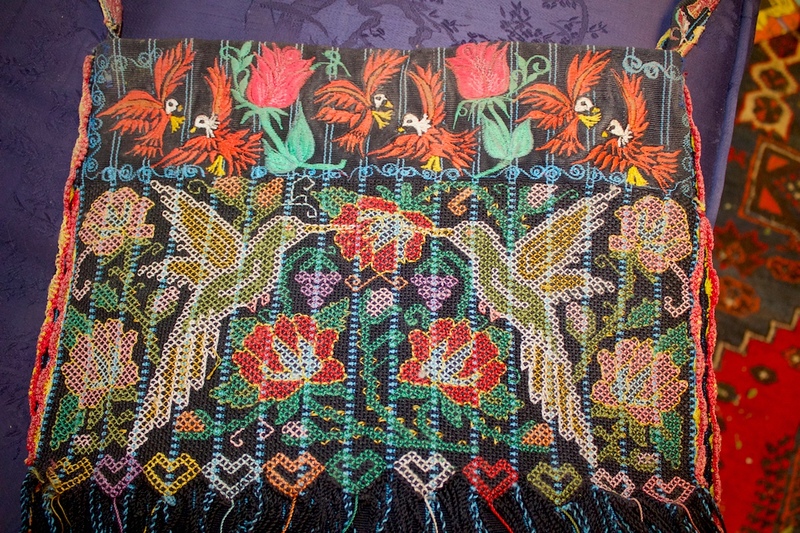 Chatino blouse detail, cross-stitch. Photo from Barbara Cleaver. 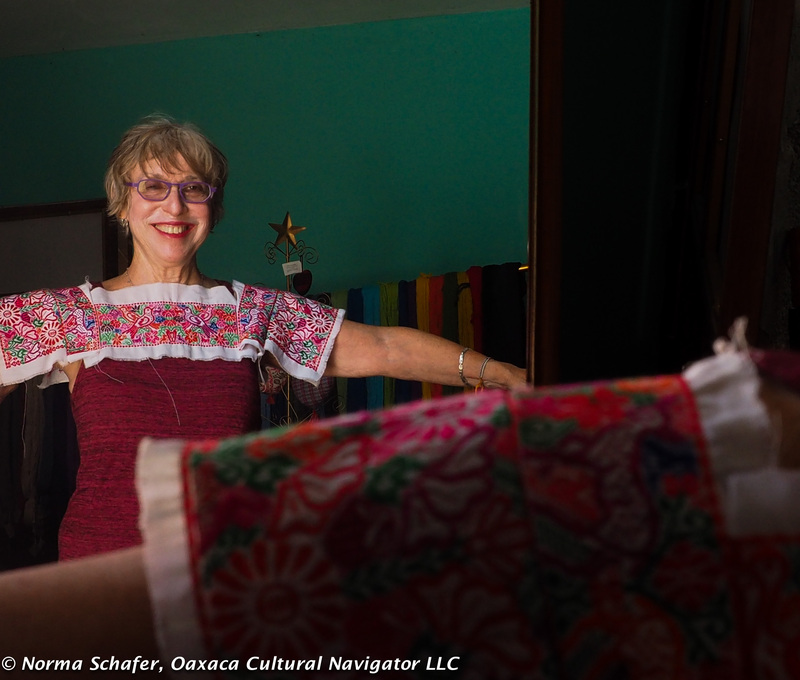 Our resource experts are Sheri Brautigam, author of Textile Fiestas of Mexico, and Barbara Cleaver, collector and owner, Hotel Santa Fe, Puerto Escondido. Sheri will travel with us on the coast to offer her textile expertise. You can read more about Dreamweavers Expoventa in Sheri’s book. *Note: Itinerary is subject to change. 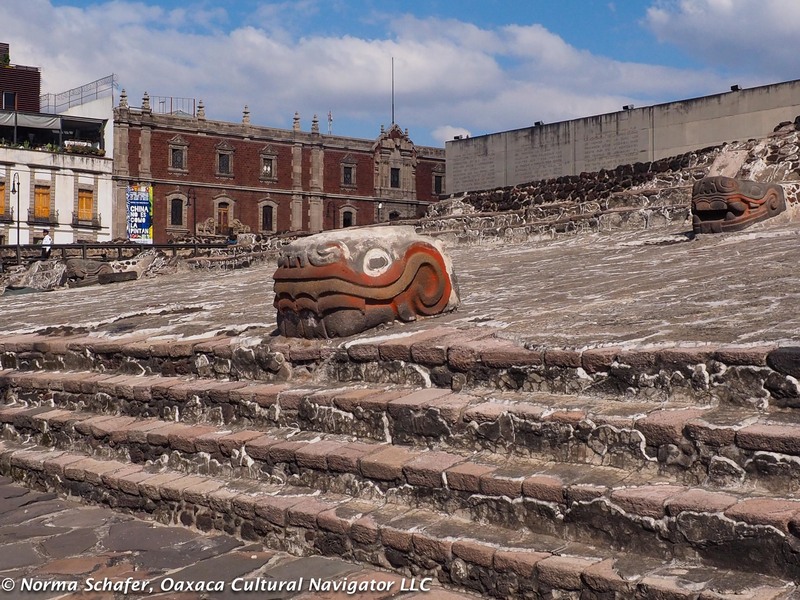 You may want to arrive early in Oaxaca city to acclimate to the 6,000 foot altitude. 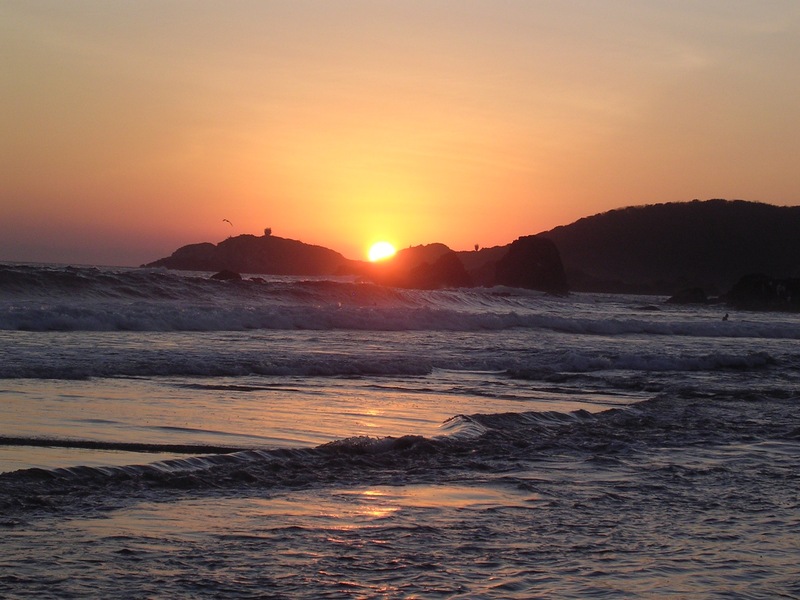 You may also want to stay later at the beach or travel elsewhere in Mexico when the study tour ends. After you register, we will provide you with hotel contact information if you want to make these arrangements directly. Reservations and Cancellations. A 40% deposit is required to guarantee your spot. The balance is due in two equal payments. The first 30% payment is due on or before October 15, 2017. The second 30% payment is due on or before December 15, 2017. We accept payment with PayPal only. We will send you an itemized invoice when you tell us you are ready to register. After December 15, 2017, refunds are not possible. You may send a substitute in your place. If you cancel on or before December 15, 2016, we will refund 50% of your deposit. 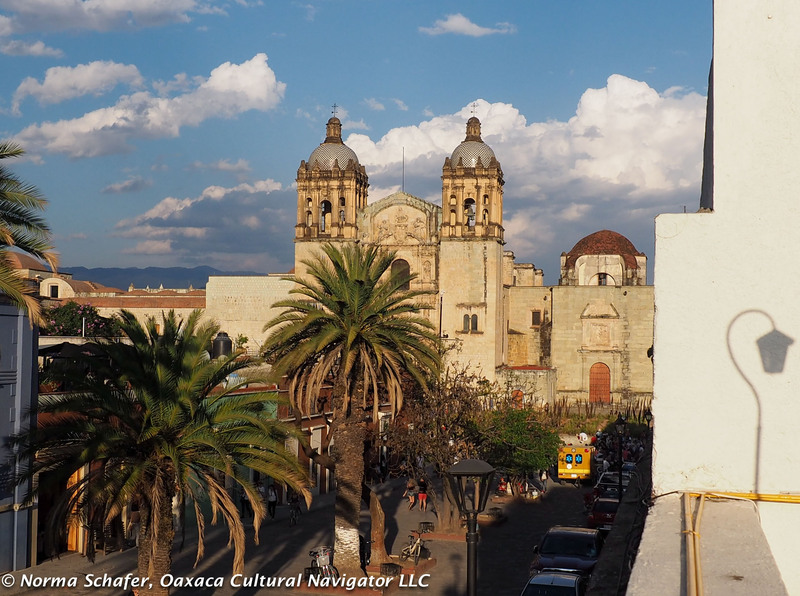 The Terrain and Walking: Oaxaca is a colonial town on a 6,000 foot high desert plateau surrounded by 12,000 foot mountains. 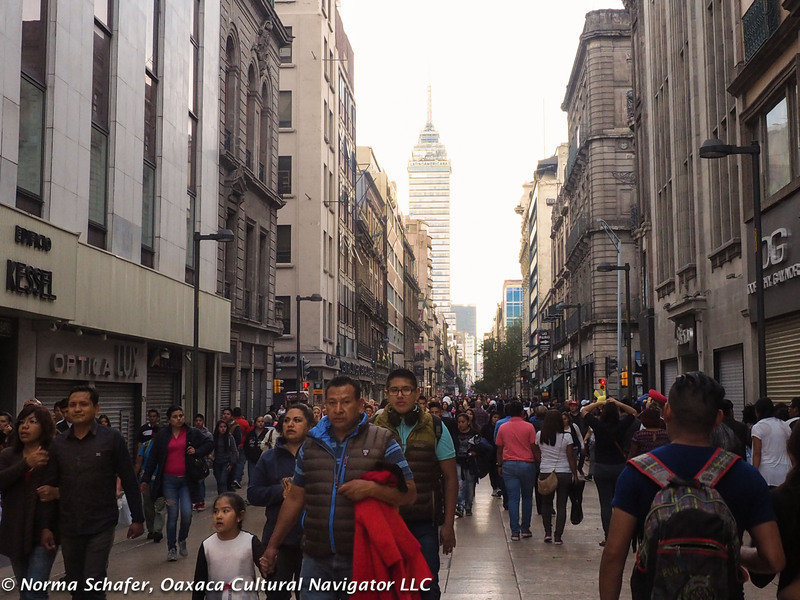 Streets and sidewalks are cobblestones, some narrow and some with high curbs. The stones can be a bit slippery, especially when walking across driveways that slant across the sidewalk to the street. We will do a lot of walking. Being here is a walker’s delight but we do tread with caution. If you have mobility issues or health impediments, please let me know. I would encourage you to consider that this may not be the study tour for you. When you tell me you are ready to register, I will send you a health questionnaire to complete first. It’s sunrise in Cuetzalan del Progreso, Puebla, Mexico. 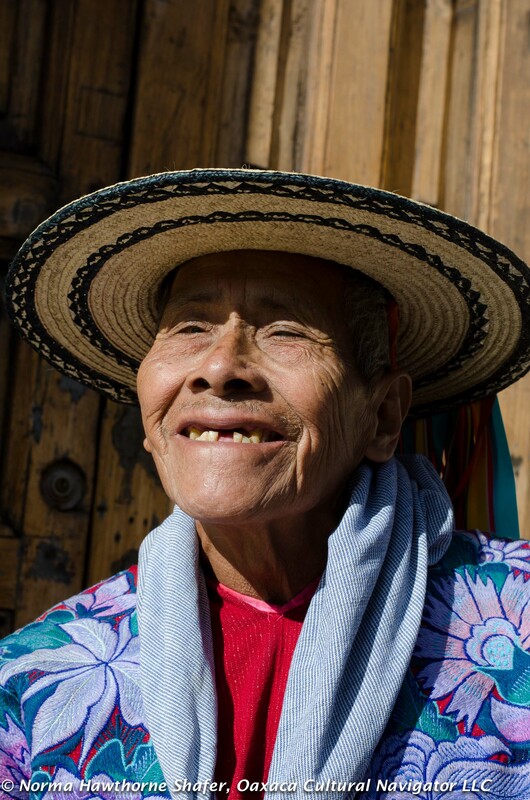 I’m high in the mountains of the Sierra Norte where the indigenous language of Nahuatl is spoken. 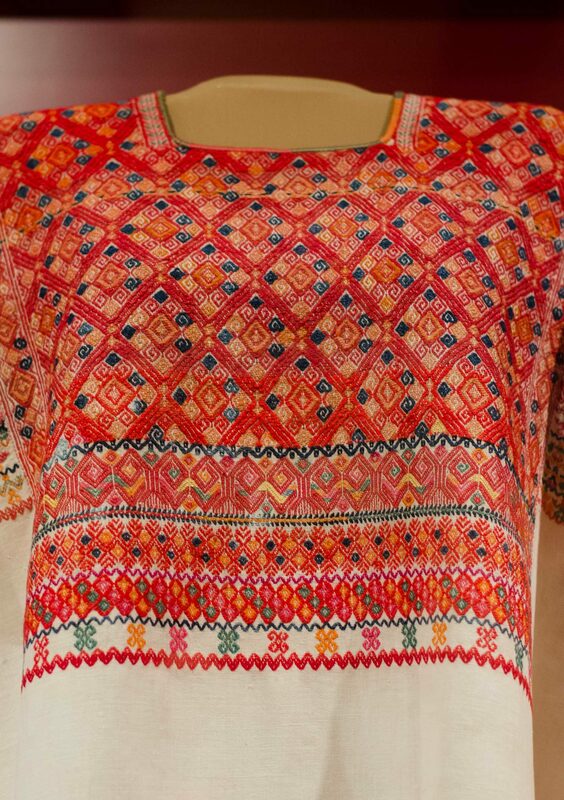 Beaded and embroidered blouses are predominant here. 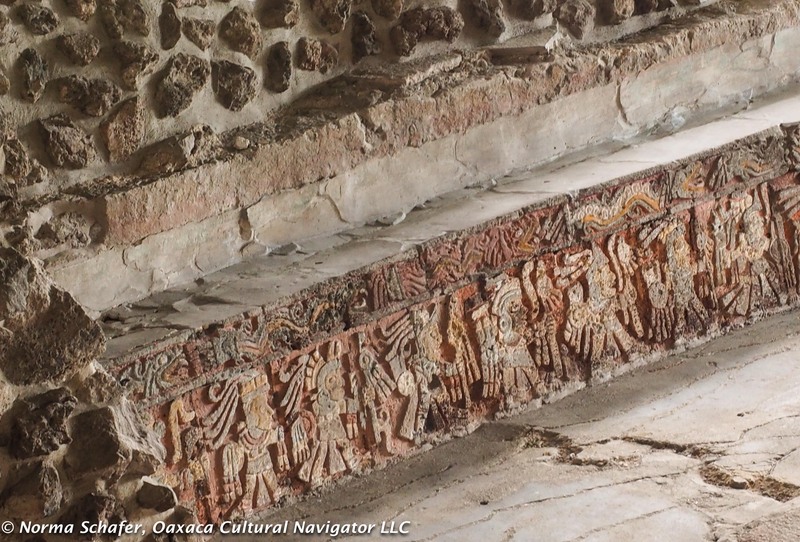 This is one of the original ten Pueblo Magico‘s and my second visit here. Definitely worth the return! 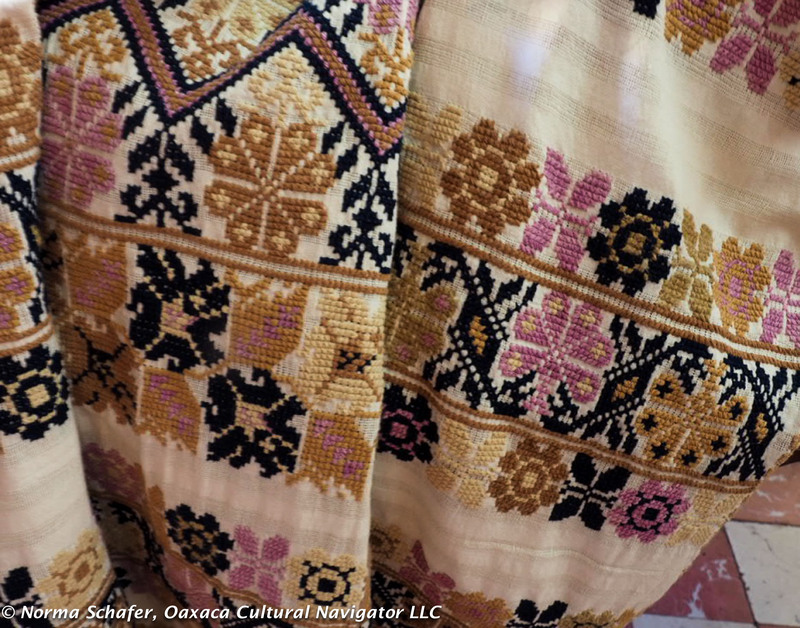 The triangular scarves and ponchos called huipiles (that I know as quechquemitls) are still woven on back strap looms. 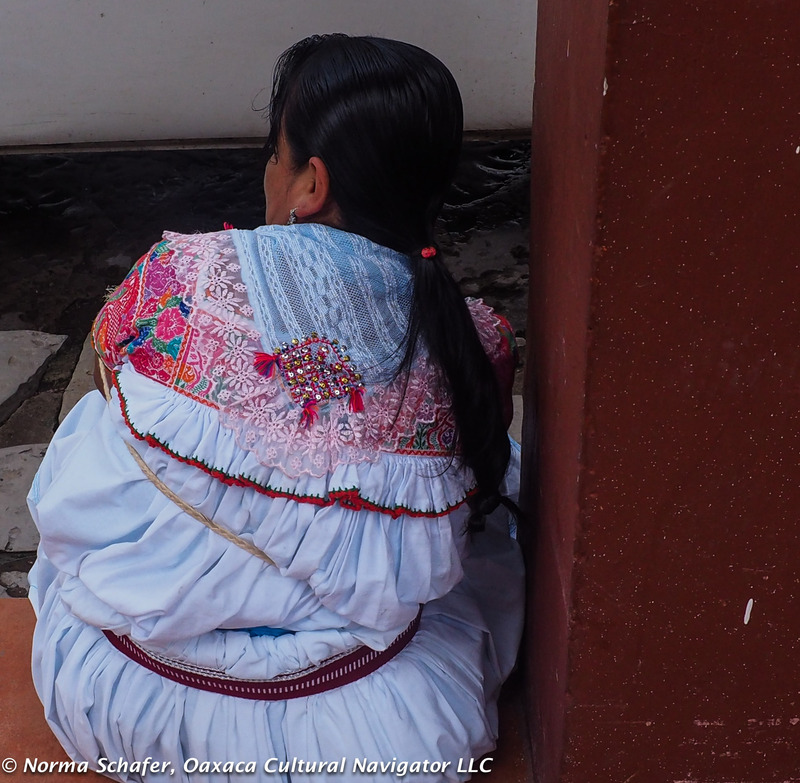 Local women walk barefoot on cobbled streets that climb and wind vertically through the village. 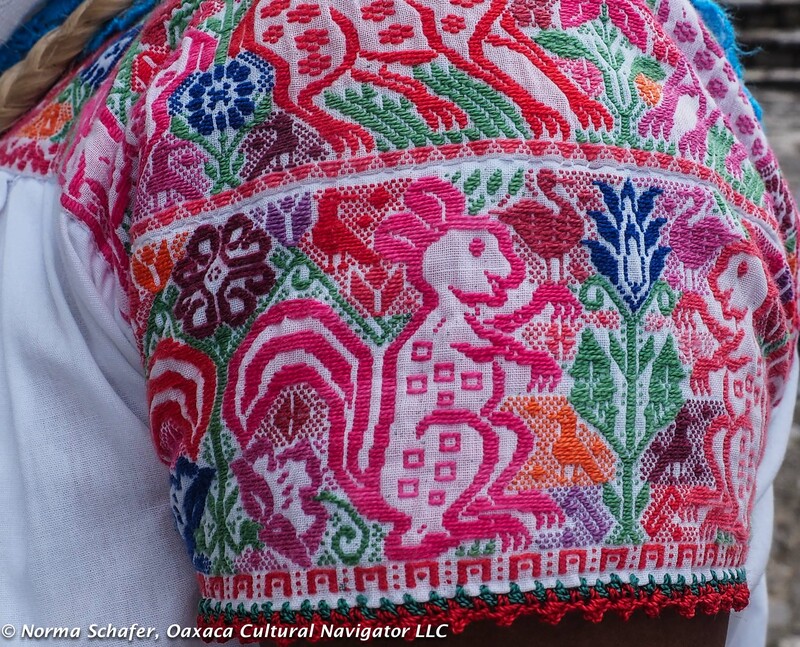 The women and girls are adorned with blouses featuring colorful figures of birds, barnyard animals and flowers, winding vines. Bodice ruffles are edged in turquoise, orange or red. Depending on their village of origin, the cap sleeve could be shirred or plain. Men wear traditional white shirts and pants, their feet protected by hand-hewn leather thongs, their heads covered in woven straw hats. Traditions are strong here. 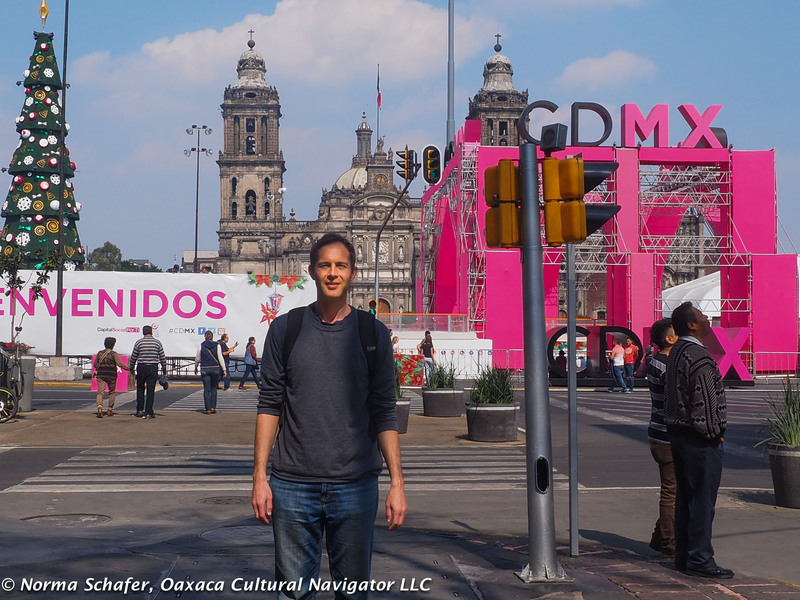 I’m traveling with my sister Barbara, who I met in Mexico City earlier in the week. 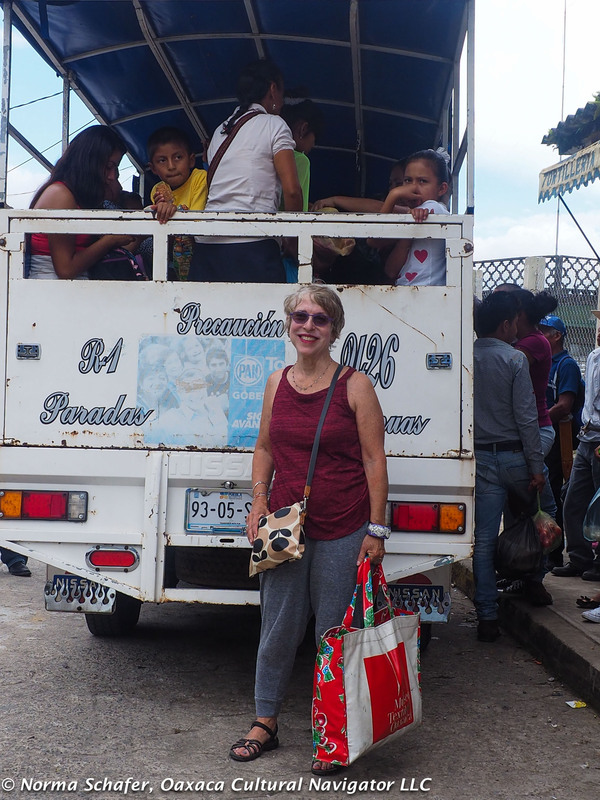 We joined up with friend Merry Foss in Cuetzalan for the annual Feria del Cafe, the raucous celebration of regional coffee. The coffee farms here are plentiful. We are at the right altitude and the beverage is delicious. 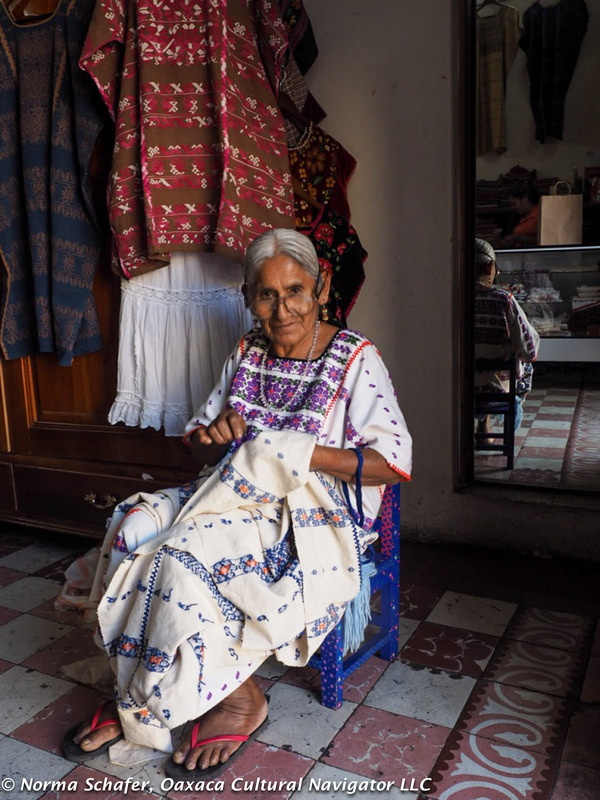 I’m using Sheri Brautigam’s guidebook, Textile Fiestas of Mexico, to find the textile artisan Pedro Martin at Taller Mazatzin known locally as Casa Rosa. 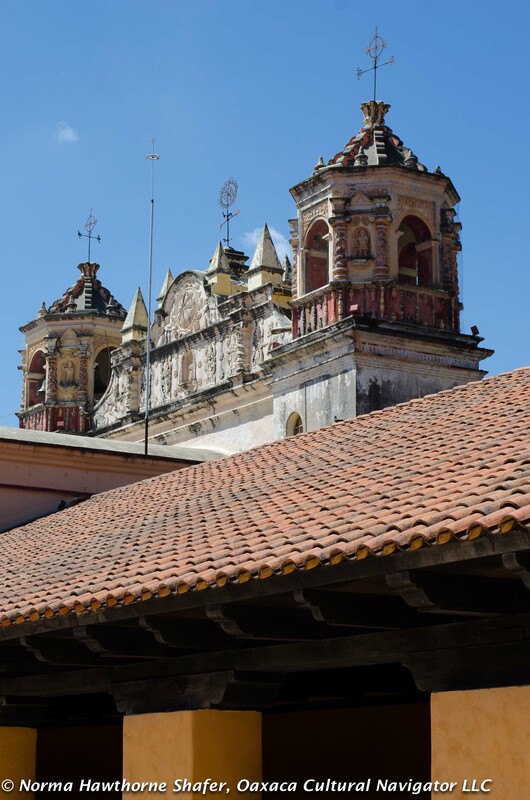 The book has an ample section on Cuetzalan. 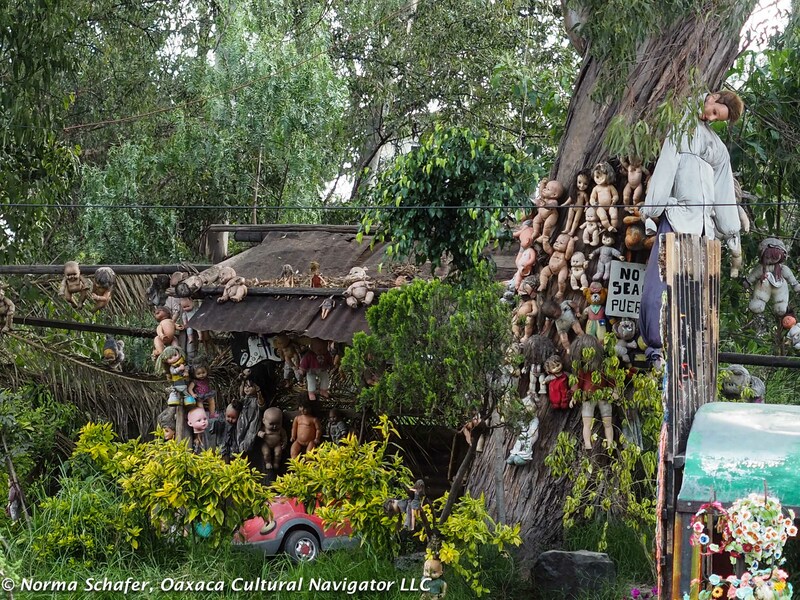 To get to his village of Cuauhtamazaco, 30 minutes from town on a winding mountain road, Barbara and I hop into the back of a covered pick-up truck that is lined with passenger benches. 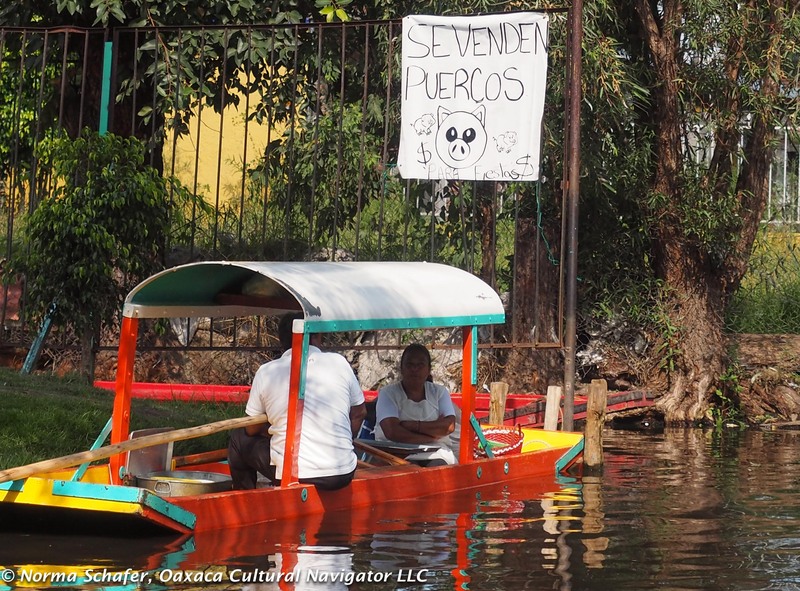 In remote regions of Mexico, this transport mode serves as the major means of getting around. Cost is 8 pesos each. 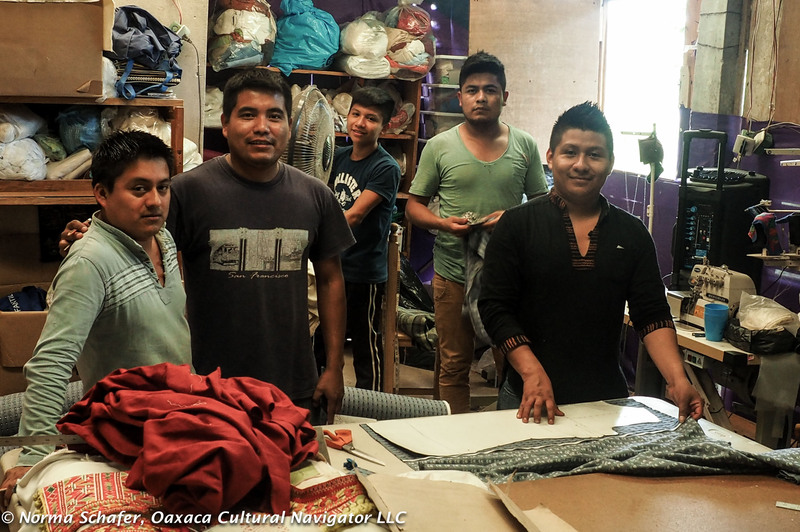 Pedro, his brother Alfredo Pizarro, cousins and nephews, work magic on a back strap loom. 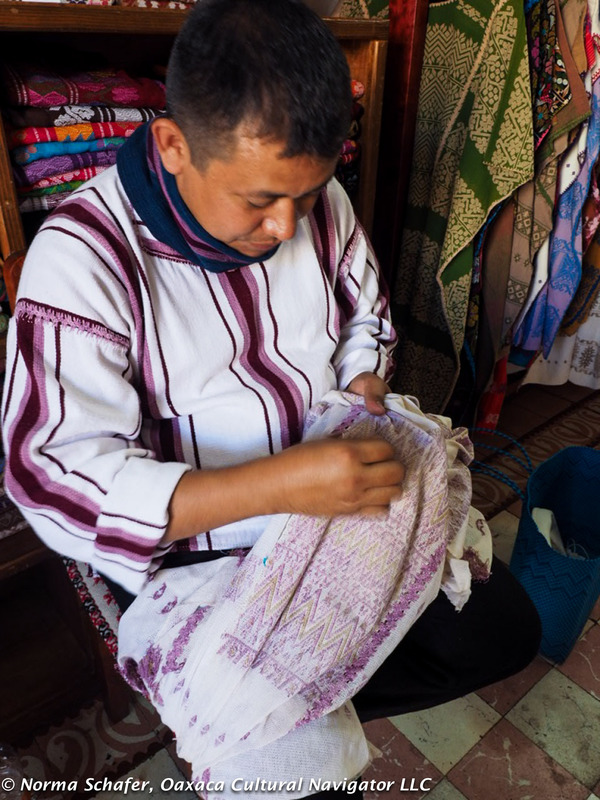 They innovate the traditional huipil design to combine colors and patterns that yields a fine cotton gauze. 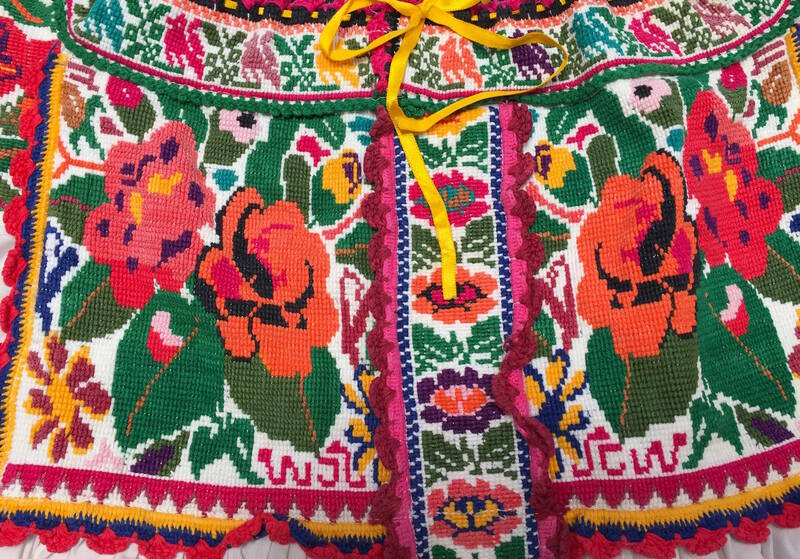 For blouses that have the intricate, detailed embroidery, they source the bodice panels from only the finest needleworkers who live in remote villages and work only in 100% cotton. 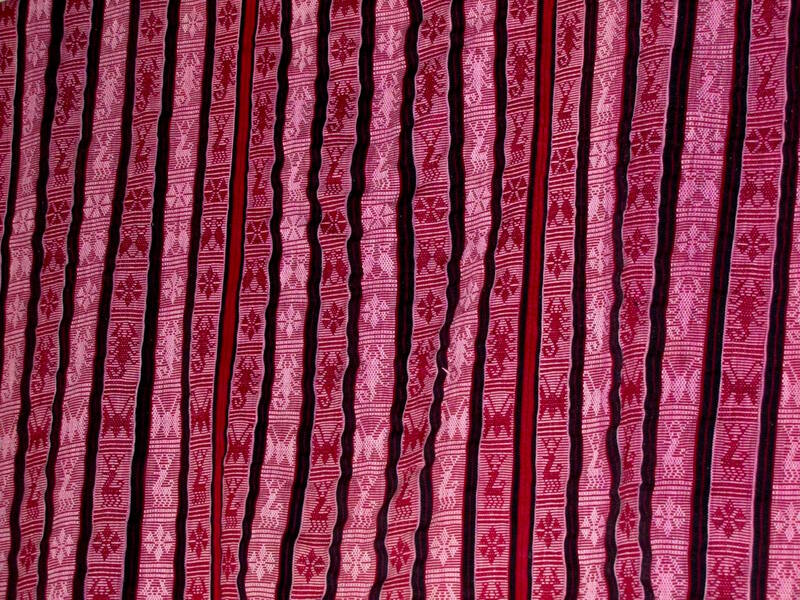 In the studio, it is the men who cut the patterns, sew and weave. 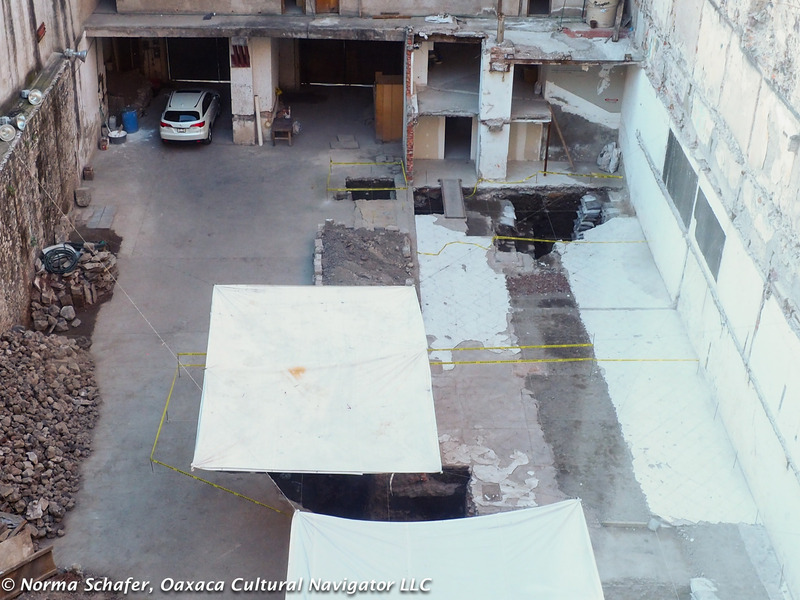 Pedro Martin and his family participated in the Feria del Rebozo at the Franz Mayer Museum, Mexico City, last year. Internet service here is intermittent. So, I’m writing before we go off to another village where Merry Foss started a textile cooperative seven years ago. 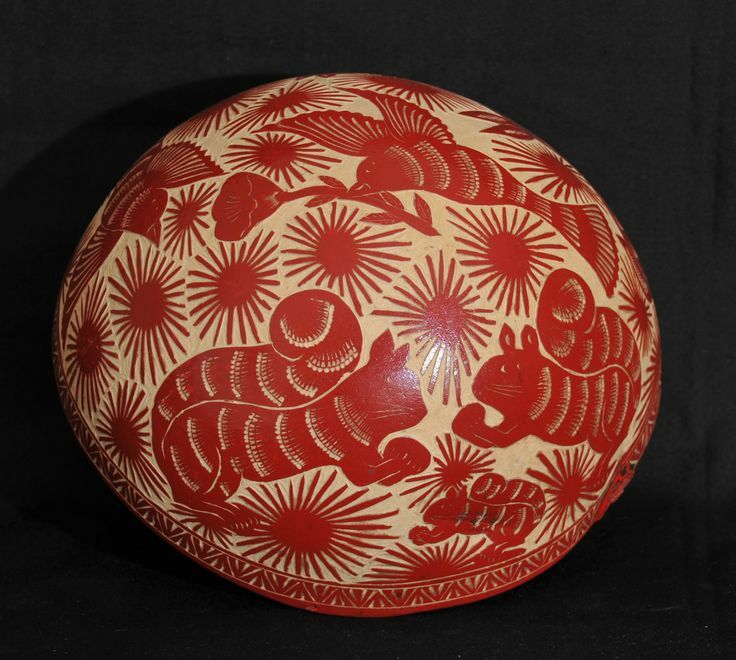 She is doing an expo-venta tomorrow morning with a group of collectors from Los Amigos del Arte Popular de Mexico, who are also here for the fair. 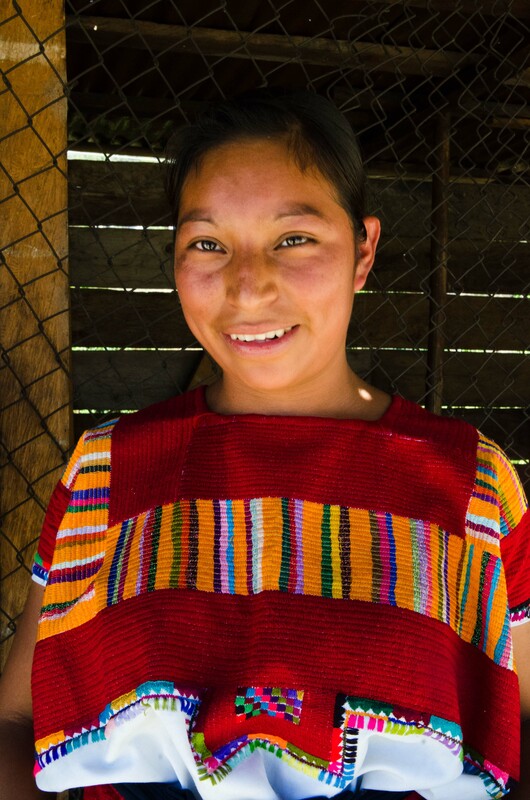 The women of Merry’s cooperative make extraordinary beaded blouses, called chakira. 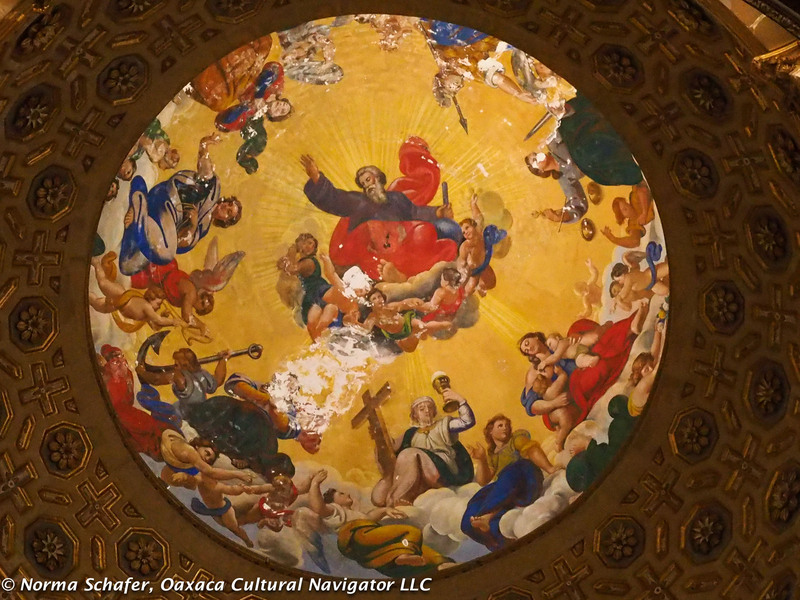 The beads originally came to Mexico from Europe and Asia as ballast on the Spanish galleons and the China Poblana shirt was born. 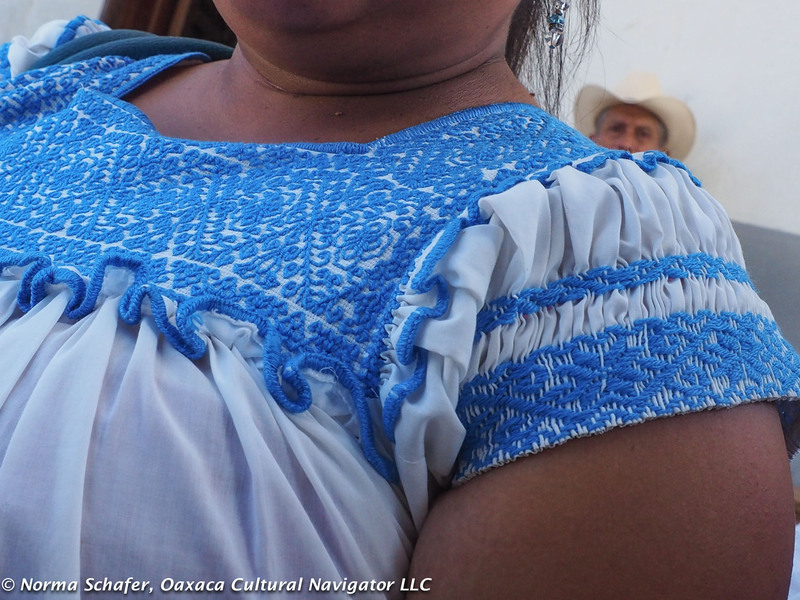 Most of the embroidery and beadwork around town is made for the tourist market and is of average quality. No fine needlework, no finished seams. You see the finest work being worn by the women themselves. The trick is to be able to locate the best of what is made. You can find a few pieces in the artisan market. (See Sheri’s book for details.) But, I’ve been asking the ladies, Where can I get one like yours? 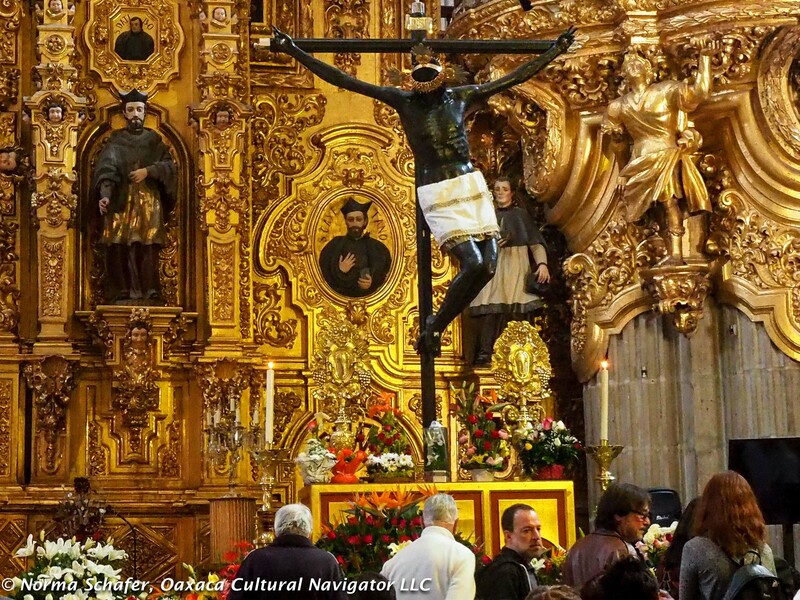 As the coffee fair started, I wandered to the church courtyard beckoned by the waft of copal incense. 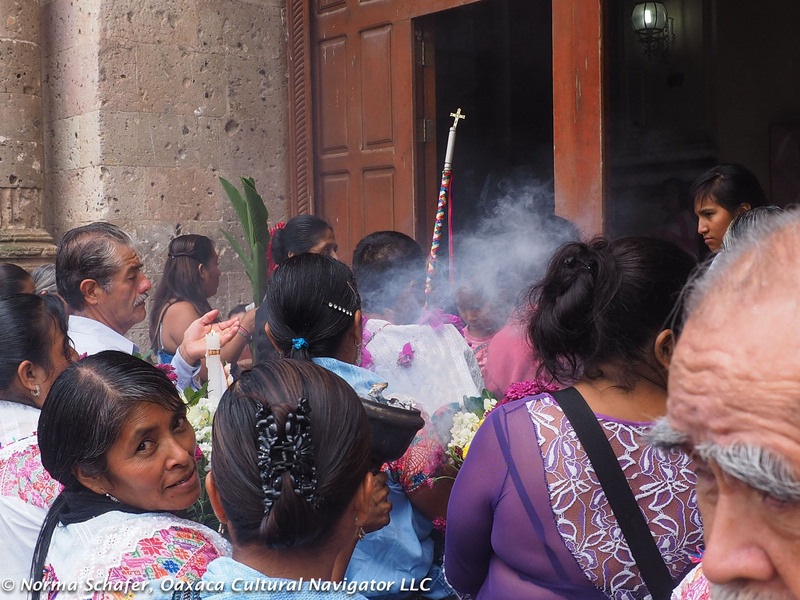 I met a group of women gathered waiting for a celebration of the Virgin of Guadalupe. 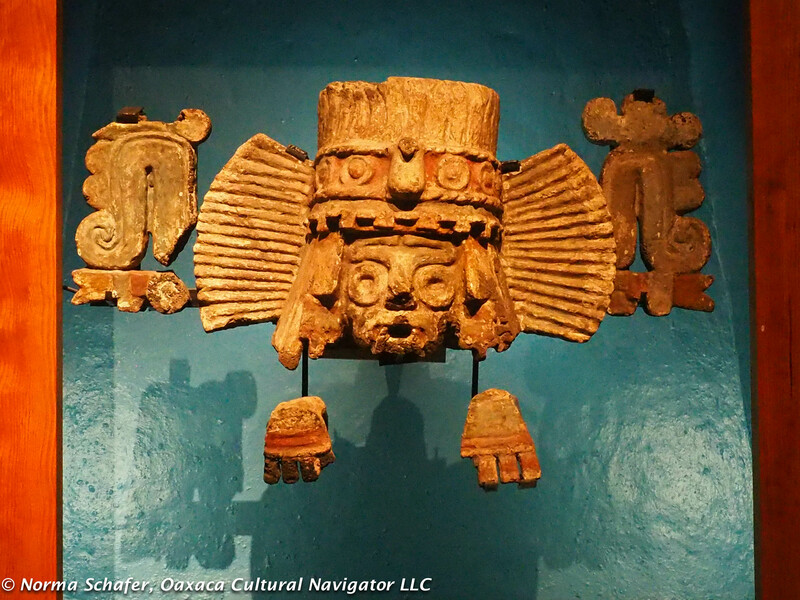 The majordoma, or leader of the group, kept the copal incense burner alive with intermittent puffs of breath on the burning coals. The majordoma turns to smile at me. I made a 100 peso contribution to refrescos. 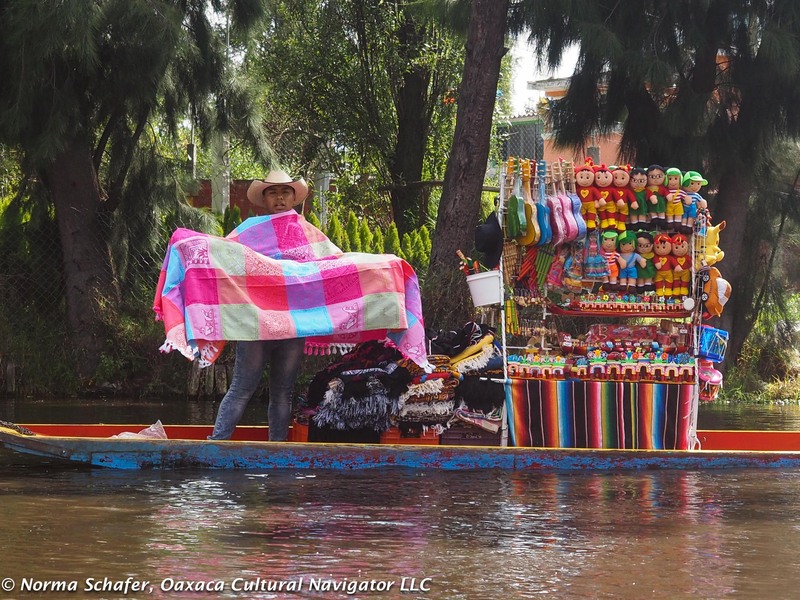 How to get to Cuetzalan: It’s a six-hour bus ride from Mexico City on ADO or Primera Plus. Almost four hours from Puebla on Via. Buy your tickets in advance. You can’t do this online! Sorry. 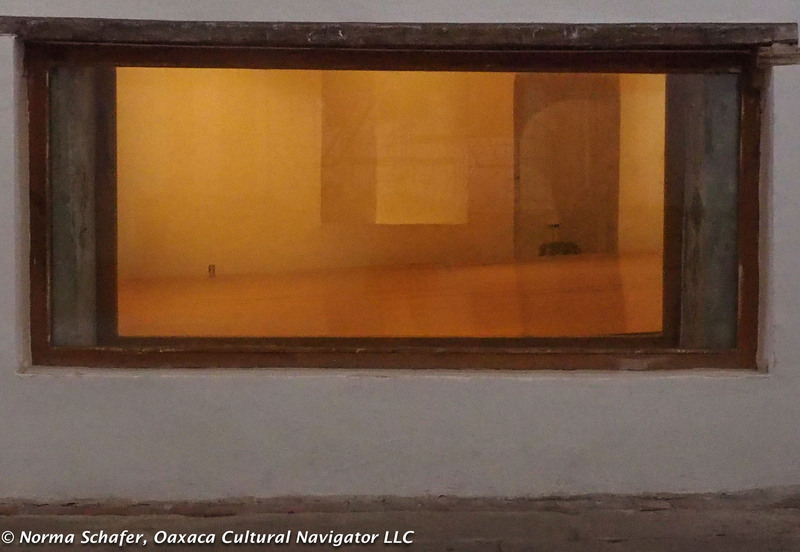 Where to stay: We are happy at Casa de Piedra, a clean, lovely hotel set down the steep hill from the plaza. It looks like a stone fortress. Great breakfast and views. Taller Mazatzin, Pedro Martin Concepcion, tel: 52-1-233-759-3992. Get the colectivo truck at the station on the street behind the church.